Chiptuning, How to save money on petrol or diesel?Chiptuning of BMW, Porsche, Bentley, Ferrari and other brands. Chiptuning for the fast and economic driving. Chiptuning is a perfect optimization of the control unit software. The main goal of chiptuning is the power increase and decrease of the fuel consumption . Modifications of the control unit have no influence on emission parameters or engine durability. All contemporary manufacturers produce novel engines, and use electronic unit controls to manage the driving of the car. Those advanced control systems are able to collect and store much information about the operation of the vehicle in its memory. Optimization of parameters stored in the memory of the control unit will save the fuel and will also help to increase the engine power and torque. For the successful adjustment of those parameters, experiences and knowledge of the chiptuning professional, who is providing the service are curtail. Chiptuning benefits, why to go for it? Chiptuning – more economical power to your car! All the serially produced vehicles have engines equipped with electronic control units. Those factory set engines do not effectively use the ability of the vehicle. This fact may be surprising for many people, but it has a logical arguments! Car factories supply vehicles to global markets; so the operation of vehicles is carried out in different climates and different operating modes. Serial production of vehicles is based on a compromise solution from an economic perspective. Therefore, serial vehicle engines have considerable reserves, chiptuning thus removes the redundancy and accurately set the parameters for efficient and economical operation of your vehicle! Is chiptuning for my car? Chiptuning can be performed at all cars, trucks and buses equipped with electronic control unit. We provide adjustments for all diesel and petrol engines, whether they have turbo or not. We also provide chiptuning services for motorbikes and vans up to 3.5 tones - those categories are becoming very popular and demand for chiptuning of motorbikes and vans is rapidly increasing. All benefits of chiptuning for the first sight! Chiptuning advantages are beneficial for every category of drivers. Reducing consumption is certainly welcomed by any driver, especially the owners of professional transport companies. Fuel cost is an important part of the transporters operating costs with a big impact to their overall profitability and chiptuning represents the saving opportunity. A broad group of people interested in chiptuning is created by people who love dynamic and sporty driving style, those who admire powerful engines and adore the speed. Because our company is also specialized in chiptuning of sport racing cars, we are able to fully satisfy these aspirations of our clients. We also provide chiptuning for veterans that are equipped with historical control units. Mainly cars manufactured in the year 1975 and above. DIESEL TECHNIK has a very extensive knowledge and experiences with all types of control units since their first launch in 1967. Why is chiptuning improving the engine performance and reducing the consumption? Increase of engine power and contemporary reduction of the fuel consumption by chiptuning may seem incomprehensible, but the explanation is perfectly logical. Higher power output and greater torque is allowing driving at lower speed gears. This reduces the number of downshifting to a lower gear. The vehicle maintains a stable engine performance even while driving uphill or when overtaking. 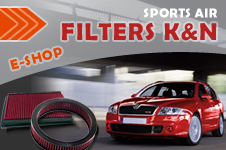 The driving is more economical and with Chiptuning you can save up to 15% of the fuel. This ability has supercharged engines such as TDI, CRDI - petrol and diesel in cars, trucks and buses. However, for engines without a turbocharger, the consumption remains the same; regardless the vehicle has petrol or diesel engine.